As speech-language pathologists, parents, paraeducators, and as people who use Augmentative and Alternative Communication (AAC), we lead awfully busy lives. I know the last thing that I want to do after a long day is to sit down and read an article dense with complicated research and academic language. It is not exactly pleasure reading and who AACtually has time for that? 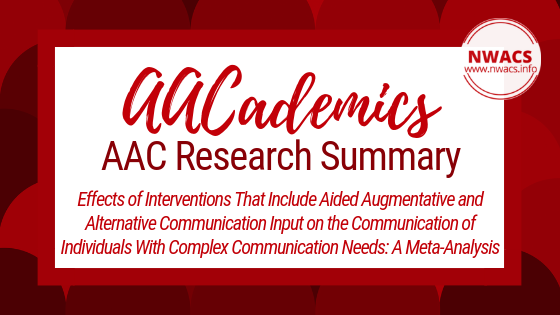 This series of research summaries will highlight the AACademic realm of the AAC world to give you easy AACces to the most current research to best serve the AAC users in our lives. Each month, I will highlight hot topics in AAC Research in a format that will make for some lighter reading. Speaking of Light reading, the first study I’ll summarize for you is a meta-analysis by Tara O’Neill, Janice Light, and Lauramarie Pope about Aided Augmentative and Alternative Communication Input. You may also know this as Aided Language Stimulation or Modeling. Modeling with AAC involves highlighting (pointing to or activating) symbols in an AAC system as we speak, so that learners can experience how their AAC system can be used to communicate for real reasons throughout their day. Meta-analyses play a fundamental role in the world of healthcare to support evidence-based practice. This research design combines the results and data from multiple studies. It is beneficial for summarizing the results of a large number of studies involving a particular intervention or therapy strategy to tell whether that method is effective. What better way to kick things off than with one geared at such an important component of AAC - Modeling. As always, I will start by providing the definition of some key terms to make the rest of the article easier to understand. Please refer to these terms at any point while reading. I will then share the research question and why this information is important to know. I will follow that with the authors’ conclusions and some important takeaways, so that we can apply this research to our AAC learners. Here we go! Aided AAC Input (aka modeling) is a communication strategy, where a communication partner teaches symbol meaning and models language by combining his or her own verbal input with a selection of vocabulary or symbols on the Augmentative and Alternative Communication (AAC) system. This is done by selecting vocabulary on the AAC system and speaking at the same time. Expressive Language is sharing thoughts, ideas, and feelings. Input is what goes in (information that is heard or seen). Meta-Analysis is a study that combines the results and data from many studies. Multimodal is using multiple forms of communication (words, vocalizations, gestures, signs, symbols, etc.) to send a message. Output is what comes out (information that is shared). Receptive Language is understanding what other people say. The research question here is: Is aided AAC input, or modeling, a helpful tool to improve the expressive and receptive language skills of AAC users with developmental disabilities? We now dive into the exciting part: why this research question is compelling. Individuals with Complex Communication Needs are mostly hearing spoken language (input) but are using multimodal AAC as the expected output mode. Aided AAC Input, or modeling, is one way to balance this mismatch between what an AAC user is hearing (input) and what they are expressing (output) [see image]. The communication partner gives a model by using speech and the AAC system to send a message to the AAC user. For example, a child’s parent may say “We are going to the grocery store”. The parent will then provide a model by touching the icons for “we” and “go” on the child’s device. Modeling is recognized as an important strategy to support a learner’s understanding of language and to demonstrate sample messages that the learner can then express. 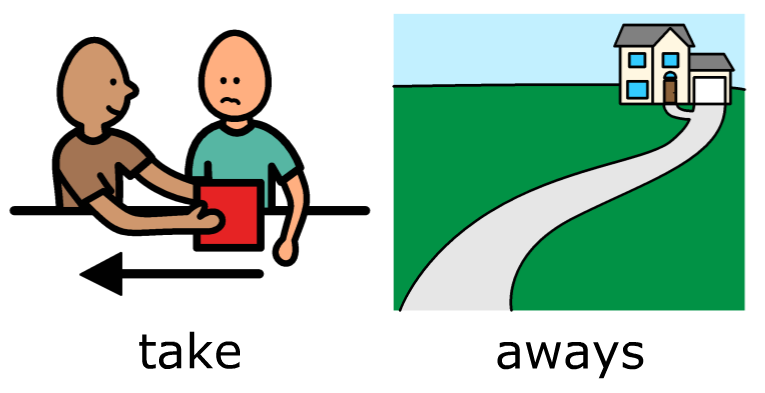 Comprehension is supported by showing the learner aided symbols (icons, pictures, etc. ), which can be a beneficial visual tool. The communication partner may also simplify their message to match the vocabulary that is available on the AAC learner’s device. Because the communication partner needs to put extra time and effort into finding the icons or symbols on the device, their message may become shorter and simpler. The slower rate of speech may also give the learner more time to understand the message. After an analysis of 28 studies, the researchers concluded that aided AAC input may be helpful. It may reduce the mismatch between what an AAC user is hearing (input) and what they are expressing (output). The study showed that aided AAC input supports comprehension, or understanding, and expression for those who need AAC. The results of the study demonstrate that communication partners should use modeling when engaging with AAC users. Users of various ages, diagnoses, and language abilities benefited from models. Modeling can be beneficial when used by everyday communication partners in natural settings (home, community). Some of the studies provided modeling over a short period of time (even as few as 5 hours of treatment!). Modeling can be useful when used alone or along with other strategies. However, the authors stated that it is difficult to say how exactly to provide models to AAC users because of the differences between the studies. Overall, the results of the study show that modeling is an effective strategy to use with AAC users. Instruction and training for parents, school employees, and other communication partners in these strategies should result in improved outcomes for AAC users. Camarata, S., & Nelson, K. (2006). Conversational recast intervention with preschool and older children. In R. McCauley & M. Fey (Eds. ), Treatment of language disorders in children (pp. 237–264). Baltimore, MD: Brookes. Porter, G., & Cohen, S. (2011). Pragmatic Organisation Dynamic Display Communication Books: Introductory Workshop. Glen Waverley, Australia: Cerebral Palsy Education Centre.